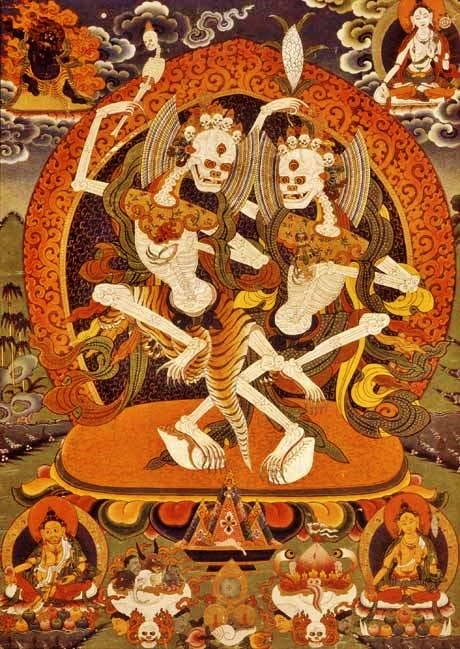 In the sacred Tibetan Skeleton dance two Dharmapalas (Protectors of Truth) appear, played by Monks, deities whose role is to protect the cemetery grounds. Their presence also reminds the audience of the ephemeral nature of this world and of their own mortality. The cult of the “Second Buddha,” Padmasambhava, initiated the practice through the rich mythological literature. Every Tibetan Buddhist monastery is guarded by fearsome protector deities – the Dharmapala: demonic entities ringed by fire, with wild eyes, sharp claws, long fangs, garlands of human skulls and multiple arms carrying weapons and potent symbolic objects. Despite their fearsome appearance, they protect the dharma (Buddhist teachings) from the forces of ignorance, attachment and aversion. The Skeleton dance is a sacred Tibetan ritual found in Himalayan Buddhist lineages. The skeletons depicted are Chitipati (or Citipati), a pair of lovers known as the Lord and Lady of the charnel ground whose dance represents the eternal dance of death, as well as the attainment of perfect consciousness. They are worldly guardians, depicted as skeletons, each with a third eye of wisdom, holding scepters made of human heads and spines in one hand and a blood-filled kapala, sometimes with a still warm brain inside, in the other hand. The often performed dances reflect the Tibetan Buddhist teachings of the impermanence of all aspects of life, and trace their history back to the mystical and shamanistic pre-Buddhist Bon religion. Skeletons represent the disintegration of phenomena, including the body itself, as well as various states of mind. The dance celebrates the liberation that comes from acceptance of our impermanence. Some have confused the Buddhist protector deities Shri Shmashana Adhipati with the Chitipati of the Tibetan Skeleton Dance. The former are divine protectors, while the dancers are of this world. The Lord and Lady can usually be distinguished from other skeleton deities by the crowns with five small human skulls, as well as the fan-shaped ornaments on their ears. They represent a “dynamic vision of death and transformation” and a “joyous freedom from attachment” rather than “morbid pessimism” as the imagery conveys in Western societies. According to the literature, they are not to be confused with Shmashana Adhipati who are ‘wisdom protectors’ and emanations of Chakrasamvara and pictured above. There are secret Skeleton Dances that accompany chod, or cemetery practices. Not seen publicly, they are performed within the monastery or alone in a cemetery. Meditating in a cemetery or in charnel grounds is one of the advanced practices a yogi can do in order to better understand their impermanence. The Skeleton dances were initiated by Padmasambhava’s visionary appearance in ancient Buddhist literature (literally “Lotus Born,” also known as Guru Rimpoche). This obscure 8th Century Indian sorcerer inspired a major cult following in the 11th and 12th Century and founded an ancient form (Nyingma) of Tibetan Buddhism. Padmasambhava was known to subdue the demonic forces that hindered the introduction of the Buddhist dharma, such as during the building of Samye, the first Buddhist monastery on Tibetan ground. This was in accordance with the tantric principle of not eliminating negative forces but redirecting them to fuel the journey toward spiritual awakening. According to Tibetan Sacred Dance by Ellen Pearlman, one day after he abdicated the throne bequeathed to him by his adopted father, Padmasambhava danced on the palace roof holding two scepters, one a vajra [ritual object to symbolize both the properties of a diamond (indestructibility) and a thunderbolt (irresistible force)], the other a trident. As he twirled around, he accidentally dropped the vajra on the head of one of his father’s minister’s young sons. The trident also pierced the heart of the boy’s mother, the minister’s wife. Both were killed instantly. Though unintentional, this act was considered murder, and King Indrabhuti — already incensed by Padmasambhava’s abdication and other controversial behavior — banished his adopted son to the charnel grounds, where dead bodies were left in the open to decay and be eaten by animals. This suited Padmasambhava fine, and using human skulls, he constructed a mediation temple with eight doors. Padmasambhava later meditated in many cemeteries, including one near Bodhgaya, the site of Buddha’s enlightenment. Although he received many helpful visions from protector spirits, it was not unusual to encounter unfriendly deities during such meditation practice. Thus, in the Skeleton dance, Padmasambhava can adopt a wrathful form of nine heads and eighteen arms in order to fend off his attackers.